This novelty geometric print in white and light blue is based on the pelicans at Pismo Beach in California. A few cheeky pelicans have even swooped a fish - lucky birds! If you like to relax in style, our signature lounge trousers are for you. 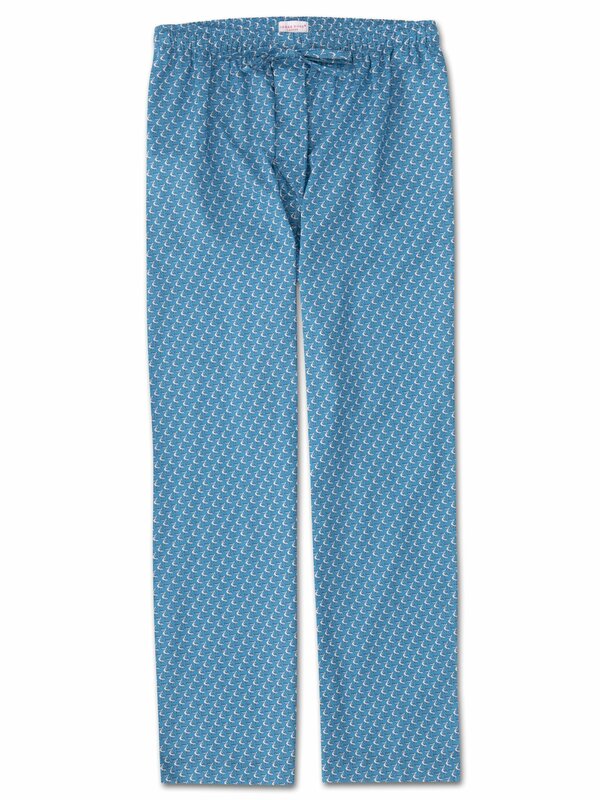 A beautifully soft, lightweight and vibrant cotton forms the base of our Ledbury 16 men's lounge trouser. Designed and cut for a generous and relaxed fit, they are perfect for putting your feet up on evenings and weekends. Our lounge trousers feature a combined elastic and self-fabric tied waist for a comfortable fit and two inset side pockets and a rear patch pocket to help keep your phone and other items close while you're lounging. A concealed button fly also ensures practicality is not lost.